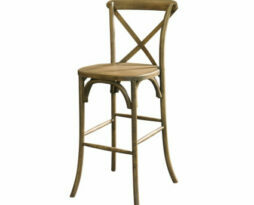 This stylish French country farm bar height chair is a rustic centerpiece that will take your event to another level. 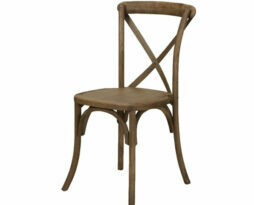 Adding the French country x-back wood bar chair to your event will bring your guests to a different place and time. This chair is very common for use in tented events, weddings, corporate functions, fundraisers, benefits, galas, product introductions, and for any event where making a dated impact is the intended result. 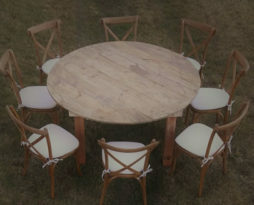 This stylish French country farm dining chair is a rustic masterpiece that will take your event to another level. 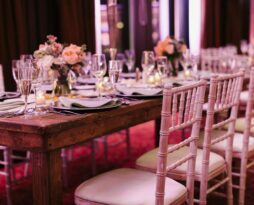 Adding the French country driftwood x-back all wood chair to your event will bring your guests to a different place and time. This chair is very common for use in tented events, weddings, corporate functions, fundraisers, benefits, galas, product introductions, and for any event where making a dated impact is the intended result. This stylish rental driftwood round farm harvest kings French country farm dining table is a rustic masterpiece that will take your event to another level. Renting the round farm harvest kings French country farm dining table to your event will bring your guests to a different place and time. 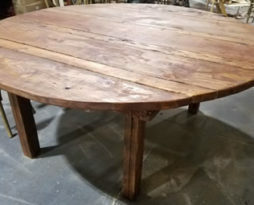 This table is very common for use in tented events, weddings, corporate functions, fundraisers, benefits, galas, product introductions, and for any event where making a dated, vintage, and rustic outdoors impact is the intended result. This stylish rustic farm dining table bench is an eco-friendly conceived masterpiece that will take your event to another level. We worked with a regional wood master craftsman to utilize cedar that was heading for the scrap heap and shredder to create these unique items. The tall cedar giants these were conceived from are now a permanent part of our rental inventory and grace events throughout the region with their unique character and beauty. Adding this table bench to your event will bring your guests to a different place. 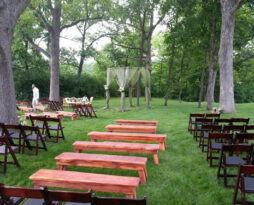 This table is very common for use in outdoor weddings, outdoor events, indoor events, tented events, weddings, corporate functions, fundraisers, benefits, galas, product introductions, and for any event where making a dated and rustic outdoors impact is the intended result. This stylish rustic farm dining table is an eco-friendly conceived masterpiece that will take your event to another level. We worked with a regional wood master craftsman to utilize cedar that was heading for the scrap heap and shredder to create these unique items. The tall cedar giants these were conceived from are now a permanent part of our rental inventory and grace events throughout the region with their unique character and beauty. Adding this table to your event will bring your guests to a different place. 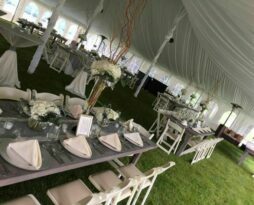 This table is very common for use in outdoor events, indoor events, tented events, weddings, corporate functions, fundraisers, benefits, galas, product introductions, and for any event where making a dated and rustic outdoors impact is the intended result. 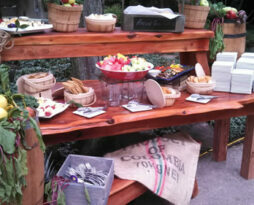 Rent a harvest farm table bench for your next Chicago special event. This bench measures eight feet (8Ft, 8 Foot, 8′) in length and 11 inches in width. This harvest farm table bench can accommodate 4 to 5 guests. Its color is a medium to dark walnut. The rental item is distressed to carry aging in its visage. Rent this item for your special event, wedding, wedding reception, Gala, fundraiser, or outdoor party! This farm bench rental can be used on most surfaces, call us with specific questions. Two great uses of this harvest farm table bench rental are for ceremonies and alongside our beautifully rustic harvest vintage farm table. The color is a dark walnut. 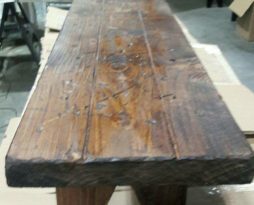 This bench is weathered and aged to capture the look that every customer is screaming for this year! This stylish round farm harvest kings French country farm dining table is a rustic masterpiece that will take your event to another level. Renting the round farm harvest kings French country farm dining table to your event will bring your guests to a different place and time. 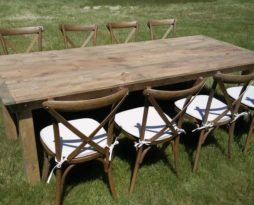 This table is very common for use in tented events, weddings, corporate functions, fundraisers, benefits, galas, product introductions, and for any event where making a dated, vintage, and rustic outdoors impact is the intended result.